It is not news that the Certified Internal Auditor (CIA) exam has changed in 2019. For most people, this means you should already be studying for the new version of the exam. But, if you’re an international candidate or non-native English speaker, you need to decide which language you are going to take the exam in before you can start preparing. Because the CIA exam is offered in many different languages, The IIA is releasing the new version on a staggered timeline. This means that for 2019 and 2020 there will be two versions of the exam available (the old version and the new version offered January 1, 2019). If you take the CIA exam in a language prior to its new version release, you’ll be taking the old version of the exam. Don’t worry though – if you pass the old version, you will not have to retake it. Credit for any passed CIA exam parts will carry over onto the new version of the exam once the translation is available. With two versions of the exam available at the same time, it is natural to question which version you should take. After all, if you are comfortable with any of the languages offered and are well into your 2018 preparations, it could be tempting to take the 2018 exam in another language to save time, even if you are fluent in English. That said, The IIA is updating the CIA exam to bring it in line with industry standards and practices, so the new material being tested is already considered industry standard around the world. 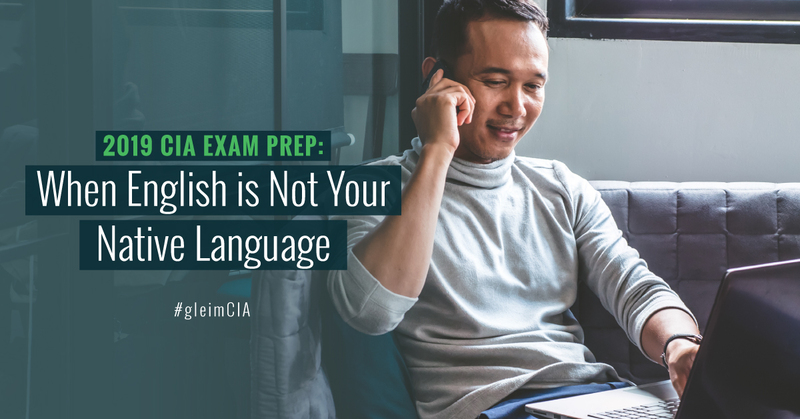 In addition, because much of the CIA exam is written in English and then translated to other languages, it is possible that some questions might be more confusing than they would have been in English. With those considerations in mind, the only good reason to take the 2018 version of the exam is if you are more comfortable taking an exam in a language other than English (or one of the other languages that has been updated on your exam date). Whether you’re taking the old or revised version of the CIA exam, Gleim has the CIA exam study materials you will need to help you pass the first time! Gleim has already updated CIA Review materials for the new 2019 CIA exam, but we are still supporting the 2018 CIA Review for those candidates who will need to take the previous version due to the language they are sitting in. If you still wish to access the 2018 materials, you can let Gleim know by contacting your Personal Counselor by phone at 800.874.5346, ext. 498, or via email at personalcounselor@gleim.com. In addition, Gleim will continue to sell the 2018 version of our CIA Review until The IIA has updated all translations of the CIA exam to the new version. In addition to continuing to support the 2018 CIA Review in English, Gleim also offers CIA exam preparation materials in the following languages: Spanish, Portuguese, Chinese Simplified, and Turkish. Gleim wants to help you pass the CIA exam in 2019. A comprehensive review system should help you prepare for and pass all three parts of the CIA exam in 20 weeks or less. Because we know flexibility is important, we offer an Access Until You Pass® guarantee with our Premium CIA Review System. This means you will always have access to your Gleim CIA materials until you pass, with no further fees required. Try the Gleim Premium CIA Review Course with SmartAdapt™ for free and receive 18 months of unlimited access to an entire study unit for CIA Part 1, Part 2, and Part 3.